WAIST HIGH: Happy 25th Birthday Synchronicity. The fifth album by The Police, Synchronicity went to #1 in the US, "ending the reign of Michael Jackson's Thriller for a while." Synchronicity won a Grammy for Best Rock Performance by a Duo or Group with Vocal in 1983. "The album's title was inspired by Arthur Koestler's The Roots of Coincidence, which mentions Carl Jung's theory of Synchronicity. Sting was an avid reader of Koestler, and also named Ghost in the Machine after one of his works." 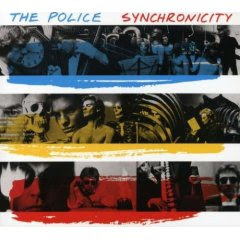 The first record that Waist High recalls purchasing with her own money, and still in her possession, Synchronicity was the last full-length studio recording from The Police, and their greatest success. "Every Breath You Take," released before the album, went to #1 on both the US and UK charts, and "King of Pain," and "Wrapped Around Your Finger" made it into the US top ten. Synchronicity is "a collection that creates and sustains a mood in the sensitive listener, a feeling that remains after the last note has died away. A benchmark album from a tremendously influential band, it will stand the test of time as a genuine classic." In February 2008, The Police announced that once they are finished touring, with their final show in New York City, they will break up again. According to Sting, "There will be no new album, no big new tour, once we're done with our reunion tour, that's it for the Police."